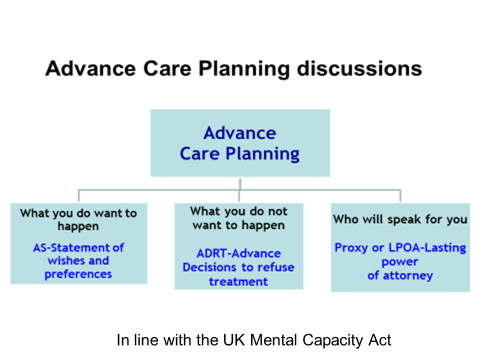 ‘Advance care planning’ (ACP) is the term used to describe the conversation between people, their families and carers and those looking after them about their future wishes and priorities for care. Advance Care planning is key means of improving care for people nearing the end of life and of enabling better planning and provision of care, to help them live well and die well in the place and the manner of their choosing. It enables people to discuss and record their future health and care wishes and also to appoint someone as an advocate or surrogate, thus making the likelihood of these wishes being known and respected at the end of life. The main goal is to clarify peoples’ wishes, needs and preferences and deliver care to meet these needs. In some areas this is known by other terms such as personalised care planning, anticipatory care, etc., but ACP is generally the internationally recognised term used by over 40 countries. It is in line with the UK Mental Capacity Act 2005. Advance Care Planning is a way to think ahead, to describe what’s important to you and to ensure other people know your wishes for the future. It’s about helping you to live well right to the end of your life. Thinking ahead, discussing with others and writing things down means that your wishes are known and respected, and you’re more likely to receive the kind of care you want in the place you choose if you become unwell, or if you could no longer speak for yourself. Advance care Planning is a very simple process – it’s just 5 simple steps. At this time in your life, what is important to you? What elements of care are important to you and what WOULD you like to happen in future? What would you NOT want to happen? Is there anything that you worry about or fear happening? Who would speak for you - your nominated proxy spokesperson or Lasting Power of Attorney? Do you have a legal refusal of treatment or ADRT? If your condition deteriorates where would you like to be cared for (different options or choices)? Do you have any special requests, preferences, or other comments? NB: See also any separate DNACPR/AND or ADRT documents. 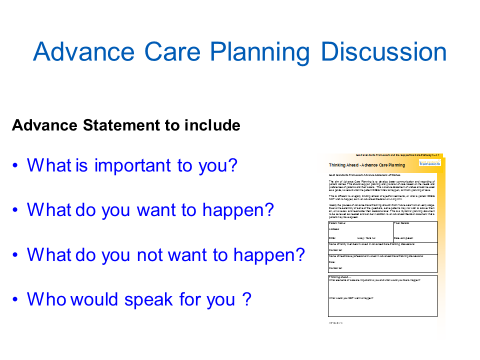 Advance Care Planning (ACP) is a structured discussion with patients and their families or carers about their wishes and thoughts for the future. In essence ACP is an important yet simple conversation that can change practice and empower patients. Health and social care providers play a key role in introducing ACP discussions at important stages of peoples’ lives eg during admission to hospital if their condition deteriorates, with their GP or when admitted to a care home (Step 4 and 5 above). But many people will already have considered these things (Steps, 1,2, and 3) even if they have not written anything down, so it is increasingly important to ask if they have discussed this or have an ACP already, to guide further discussions. What you don’t want to happen and a few might wish to describe specific medical interventions they don’t want to happen, through Advance Decisions to Refuse Treatments (ADRT), plus their thoughts on resuscitation (DNACPR or RESPECT) or if they want to be allowed to die naturally (Allow Natural Death/ AND). Who will speak for you - Most will also wish to say who might speak for the – proxy spokesperson or legal Lasting Power of Attorney. This is important particularly if it is related to the development of future incapacity, but is important for all to express their wishes. 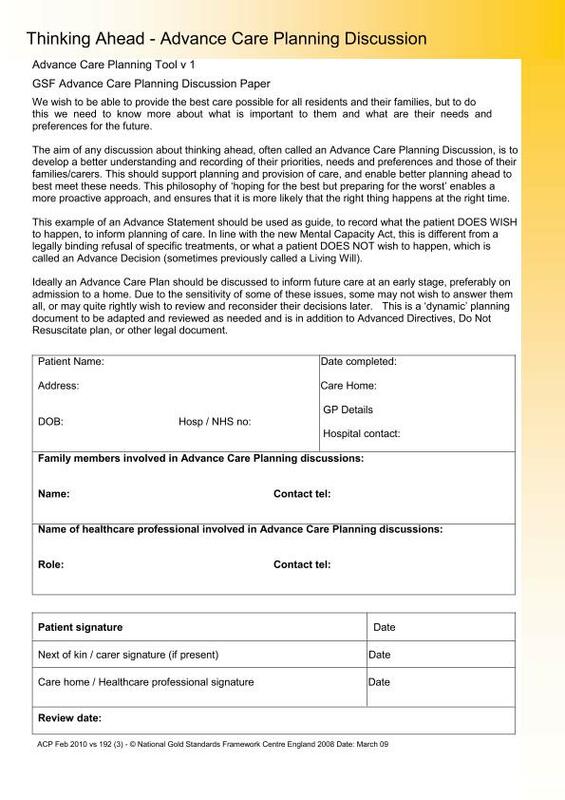 Advance care planning discussions open up a space in which such plans and reflections can be discussed, a place for contemplating future outcomes and eventualities within a safe environment in order to maximise life in the present. There can be a deeper significance of this discussion, in drawing closer to the person’s sense of meaning and core values, of the way they make sense of the world and inner life and in enhancing not decreasing a sense of optimism, self- determination, control and hope. It can be a process of discussions over time, a ‘relationship’ discussion with regular reviews and can helps catalyse deeper communication between patients and their families and loved ones. It need not be ‘over medicalised’ or too formalised, and could be undertaken by any involved in end of life care, though is best undertaken by experienced trained staff who know the person well, such as GPs, community nurses, care homes staff and specialists. Using the Mental Capacity Act - This video explains the Mental Capacity Act and how it can protect the right to make choices. For people who need the Mental Capacity Act, their carers, and others. 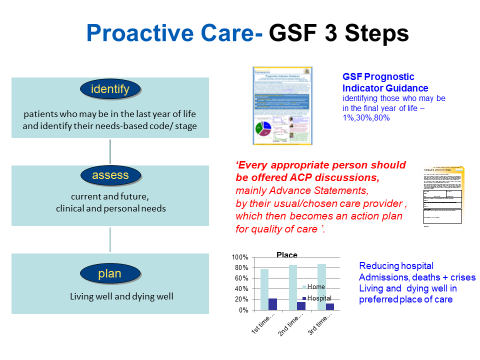 Advance Care Planning is a key part of all GSF Training Programmes in all settings and integrated as one of the building blocks to ensure proactive person-centred care, an assessed as a vital part within accreditation. 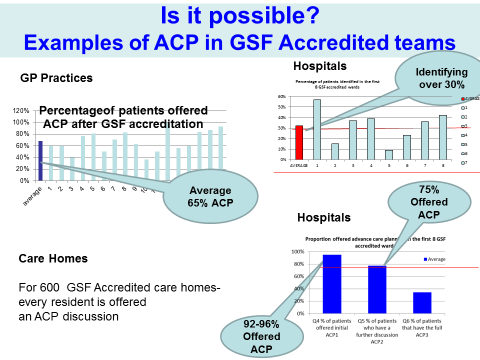 All GSF accredited teams in primary care, care homes hospitals, etc., offer ACP discussions to identified patients. GSF accredited teams demonstrate more patients being offered ACP discussions to differing degrees (the 3 Levels of ACP). To do this there are a number of documents and tools including several locally developed (see website for more examples). The actual tools follow similar lines - the tools used matter less than the process, but the important thing is to have the discussion as part of the caring and therapeutic process. There has been an evolving concept of ACP over recent decades moving from a more medically orientated ‘transactional ‘ model to the more person-centred model ‘transformational’ model. The evolving balancing of both the medical ‘transactional ‘and personal ‘transformational’ models of advance care planning. (Thomas K, GSF Centre). Why do it? What are the benefits of ACP? Enables greater autonomy, choice and control - respects the person's human rights, enabling a sense of retaining control, self-determination and empowerment. Enables deeper discussions and consideration of spiritual or existential issues, reflection on meaning and priorities and encourage resilience and realistic hope. ACP is important for those with the ability to make decisions now, to plan ahead and to live life as fully as possible until they die. It is also important to anticipate a time when they may not be able to make such decisions in future, and to plan for this eventuality. This aspect is stressed as a priority by some than by others, and it relates to the Mental Capacity Act 2005 and development of advocacy or best interest decisions, particularly in the context of the growing numbers of people with dementia. This is therefore extremely important in the many cases in which people are unable to make clear decisions at a crucial stage in their lives, not just due to dementia, but also due to changes in levels of consciousness and the incapacity of severe illness. But in addition to this, it is also widely held that in fact the process of having this discussion is as important as the outcome. 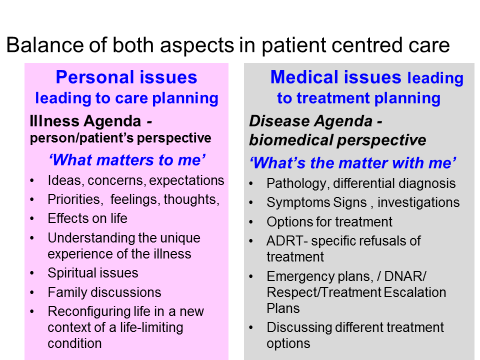 Advance Care Planning discussions can provide a possibility of clarifying future directions and choices so that the issues can be raised, examined and fully discussed, fears both trivial and huge can be clarified and addressed, and a more realistic and pragmatic approach can be taken to living out the final stage of life in the way that is important to that individual person. Advance Statements, although they are not legally binding documents, are important and should be taken into account in decision making. The Mental Capacity Act section 4.6 affirms that Advance Statements of wishes can be taken into account when considering best interest and stated preference of the patient involved: “In determining for the purposes of this Act what is in a person's best interests.....He/she must consider....(a) the person's past and present wishes and feelings (and, in particular, any relevant written statement made by them when they had capacity)." NOTE: The second edition of the OUP book ‘Advance Care Planning and End of Life Care’ edited by Keri Thomas, Ben Lobo and Karen Detering is soon to be launched by the end 2017, with updated chapters, references and resources plus international chapters describing how ACP is used across many countries of the world. The current first edition published in 2010 is still available. 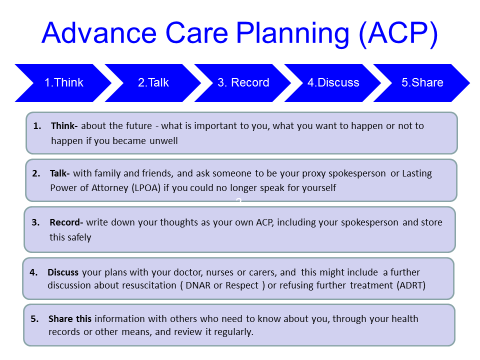 The National Council for Palliative Care - 'Planning for your future care' - a simple guide to introducing advance care planning discussions to patients. Click on icon to download the guide.